French superbantam Khedafi Djelkhir takes on capable veteran Franklin Teran for the vacant WBO Int´l 122 lb title June 8 in Besancon. Djelkir won silver in the Peking Olympics 2008 and then turned pro after a long - too long perhaps - amateur career. 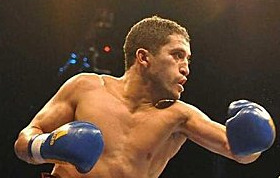 In the pros Khedafi is now 12-0 and won the national featherweight title in 2010. Teran, from Colombia, have been fighting out of Madrid for the last few years winning at home and losing the big fights abroad.